The Map of Maine's Interconnected Trail System (ITS) is provided to snowmobilers through the joint effort of the Maine Snowmobile Association and the Snowmobile Division of the Maine Bureau of Parks and Lands, Department of Conservation under the direction of the MSA Trails Committee. The trails themselves are created through the efforts of the snowmobile clubs, the Snowmobile Division, local municipalities, supporting businesses and the many landowners throughout the state of Maine who generously allow access to sledders. When viewing your printed ITS map: ITS trails are marked red, connector trails marked green. Green boxed markings (ie: AK37, PT 15) represent junctions denoted by the first and last letter of the county in which the junction is located, and the number assigned to the junction. An additional 10,000 or so miles of trails crisscross and network heavily with this system all across the state. Local clubs and towns produce local and regional maps with details of individual trail systems, a listing can be found through the link below. The ITS map is updated each year to reflect changes and additions to the trail system for the upcoming season. New maps are usually available for distribution by late October. ITS maps can be obtained from the MSA office, 7 Noyes Street Place in Augusta, at some Maine Tourism Association locations (info centers along I-95), at the annual Maine Snowmobile Show, at out of state snowmobile shows, at some MSA supporting business member locations, chambers of commerce or from a local snowmobile club. Map Image Copyright The Maine Snowmobile Association. Not available for commercial reproduction and distribution or web posting without the express consent of the Maine Snowmobile Association. Additional maps of regional and local snowmobile trail systems are produced by snowmobile clubs, Chambers of Commerce and tourism groups throughout the state.These maps depict the additional 10,000 miles of trail not covered by the ITS map.Due to scale, these maps are generally more detailed than the statewide ITS map. 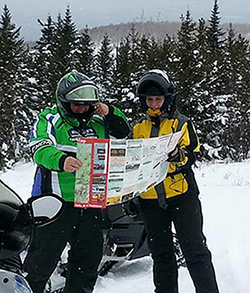 Refer to the list of regional and local snowmobile maps linked above for information on how to obtain copies.NOTE: Snowmobile maps should not be used to determine travel routes for any vehicle other than a snowmobile. It is against the law in Maine to operate an ATV, dune buggy, 4-wheel drive vehicle, motorcycle or any motor vehicle other than a snowmobile on a snowmobile trail funded by Maine's Snowmobile Trail Fund, unless the landowner has given permission for the activity. This is true at any time of the year. Stay on the marked trail, and carry a current map. Photo by Charlene McFarland.